Running an 8-minute mile requires discipline and proper training. In addition to running, exercises like swimming, muscle-endurance training and cycling indirectly increase your running speed. Generally, running farther than you need to will help condition your body to handle the stresses of an 8-minute mile. If you have very little running experience, plan to condition your body for six to eight weeks. Create a fitness plan that includes running and other exercises. If you have a bicycle, include cycling in your plan. If you have access to a swimming pool, include swimming. Plan to run every other day for six to eight weeks. Reserve non-running days for strength training, cycling or swimming. Conduct normal conditioning exercises, cycling, swimming or muscle endurance on the first day your fitness plan takes effect. Exercise for at least 30 minutes. Run 2 miles on the first day of your fitness plan. Run at your own pace and try not to walk. Time yourself with a stopwatch and write the time down on your fitness calendar. Alternate conditioning exercises and running on opposite days to allow your body time to recover. Run 1 mile as quickly as you can on the third running day of your fitness program. Time yourself with a stopwatch. This will help you determine how much work you need to do to achieve your goal. Run 2 miles on the fourth running day of your fitness program. Force yourself to beat your previous time by at least 30 seconds. Even if you cannot beat your previous time, continue to attempt it on each subsequent run day. Write your time down each day so you can chart your progress. 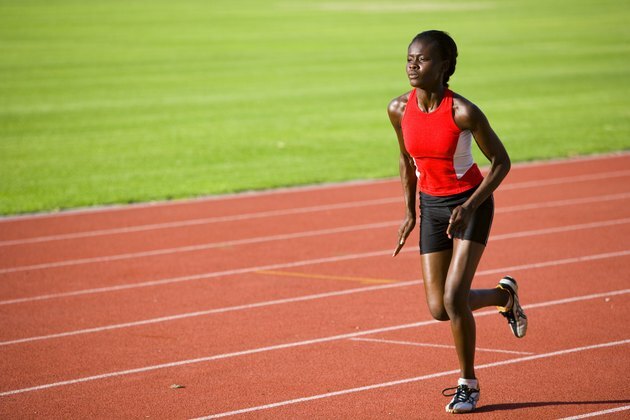 Introduce fartlek training to your running schedule. Dedicate one run per week to fartlek training. Fartlek training is the action of running at your own pace for as long as you wish and then sprinting for as long as you can. When you finish sprinting, slow to your original pace, but do not walk or stop moving. When you catch your breath, sprint again. Continue this process until you have completed your run. Evaluate your progress at the end of each week. When you see improvement, set aside one day to run 1 mile as quickly as you can. If your progress plateaus, keep trying to beat your 2-mile time by 30 seconds each time you run. Add 1/2-mile to your running distance after three to four weeks. Adding distance, even if you run at your own pace, helps build the stamina you need to run 1 mile quickly. Wear quality, well-fitted running shoes to avoid injury. Before conducting any exercise, stretch your muscles thoroughly to avoid injury. Stretch thoroughly after every exercise. Consult your doctor prior to beginning a new exercise program. Does Lifting Weights Burn More Calories Than Running?